This is intimidating, I thought to myself as I inched forwards along the grass path amongst the abundance of gulls on this tiny island. My heart was racing. Keeping my head low and putting my hands over the crown of my head trying to protect myself from being attacked I had an inkling we were not supposed to be here. My friend Heather and I go on monthly mini-adventures and in June we had hoped to go to the Isle of May to see the puffins nesting there. Unfortunately, the boat was fully booked on the day we’d planned to meet up, but luckily Heather found us a couple of tickets on the Maid of the Forth instead. The Maid would take us to another island in the Firth of Forth where we thought we might spot puffins. That was where we were, standing amongst hundreds of gulls (I kid you not) on Inchcolm Island, trying to walk to the cliffs where we thought we’d see the puffins. But these gulls were having none of it. They were protecting their young and rather fiercely and noisily. We’d not heard the warning on the boat when we docked to stay away from these paths because of the gulls. I think we must have been chatting and pointing at interesting things on the island as we got closer to it. 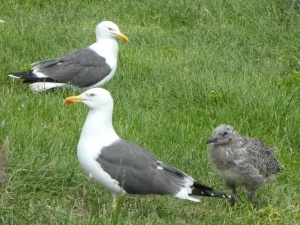 I did hear something about the gulls being very protective of their chicks, but that was about it. 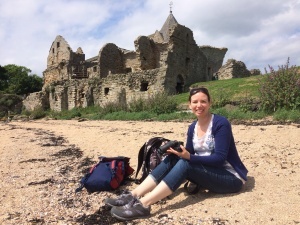 Heather and I managed to walk up the small hill to the west of the Inchcolm Abbey ruins, and when we got to the top and saw more gulls milling around ahead of us we decided not to risk it. But we had to return on the path we’d just come up on which had been a little terrifying! The gulls were swooping in above us and at one point I felt one had passed just inches above my head. Later we would find out from a girl working in the little visitor’s centre that people had been attacked before. Step by step walking back down the hill, we kept coming across the chicks and stopping to let them pass or get out of the way, and hopefully showing the gulls we were not a threat. I suddenly had an image from Alfred Hitchcock’s 1963 movie “The Birds”. Hmm. That did not reassure me at all! After what felt like half an hour rather than a few minutes we got back to the “safety” of the ruins and I breathed a sigh of relief; we agreed to stick around that area for the rest of our 2 hour visit to the island. It had taken about 30 minutes to get from South Queensferry to Inchcolm Island. It was a gorgeous day, sunny with blue skies and a few fluffy white clouds dotted around. Since I didn’t have a car at the time, I’d got the bus to Waverley train station where I embarked on a train to Dalmeny and Heather picked me up there and we drove down the hill to South Queensferry to park up near the pier. The boat was leaving at 10:30am but we could climb aboard at 10:15. We sat on the top deck facing the back of the boat. When we got going we had a great view of the three Forth bridges that connect the Lothians with Fife. On the boat there was a big group of kids – probably around 20-30 of them – dressed in pirate costumes, accompanied by a few parents. It was so cute to see. Not sure how old they all were, maybe 5 or 6 years old. When we were on the island they were on a treasure hunt and it looked like a lot of fun. I was amused and then slightly concerned when a handful of children rushed off down the beach in front of the Abbey towards the gulls and their chicks, the kids completely oblivious to possible attacks but the gulls seemed more scared of the kids and flew off! When the boat had got closer to the island I saw a couple of small birds flying over the water, and at first I didn’t recognise them, but when I looked through my binoculars I realised they were puffins! I almost couldn’t believe it, they were much smaller than I’d imagined. This was my first time seeing them in the wild. 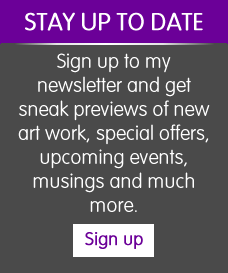 It made my heart jump with joy! 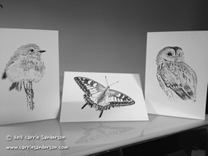 I had taken my usual little travel sketchbook with me as well as my new camera (see my post Photography Feeds My Creative Practice), and a pair of binoculars. After we’d explored the ruins, we sat down on the little beach facing south. South-east of us was Edinburgh. I took out my sketchbook and sketched the gulls, mainly in flight. Observing them through my binoculars, their behaviour and beauty. Noticing my own feelings as I was watching them – the joy and delight especially when discovering new patterns of movement and behaviour. I could have stayed there all day. On the way back on the boat we passed around the east and south of the island and there I saw more puffins, a group of 5, paddling in the water and as we got closer they took off, feet skimming the water as they gradually launched into the sky. It was magnificent. There were also oystercatchers, different types of gulls, fulmars, kittiwakes, female eider ducks….and seals! We saw quite a few, bobbing in the water with just their heads sticking out. Earlier, Heather and I had spotted a cheeky seal who was slowly getting closer to the shore where the gulls and their chicks were hanging out. The gulls’ screams got louder as the seal’s head kept popping up, getting closer by the minute. A couple of gulls then took flight and swooped down on the seal to try and chase it off. We’d wondered whether the seal was after the gulls’ chicks, some of which were milling around the water’s edge, and like the little pirate kids, seemingly oblivious to the fact they were possibly in danger. The gulls were doing a good job protecting their young! Their maternal instinct was kicking in and it made me feel for the gulls. They were mothers wanting to see their children survive. 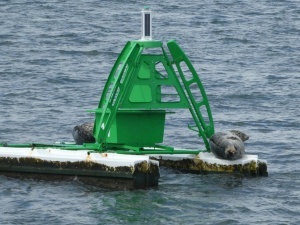 It took about an hour to get back and as we passed some of the buoys we saw seals lazily lounging on them. 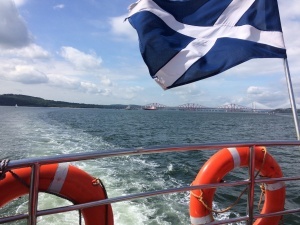 The Captain of the Maid took us past South Queensferry and under the three Forth bridges and then turned around to head back to the pier. The commentary on the boat was great and really interesting, and I felt it added value to the whole experience. 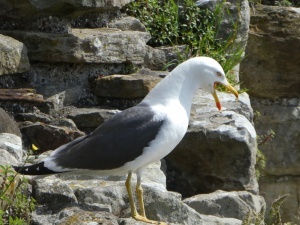 I would definitely recommend the trip to Inchcolm Island and I’d do it again…but maybe not when there is a possible “attack of the gulls”!